Christmas Bazaar and Gift Auction. Get a sneak peek at some great raffle prizes. 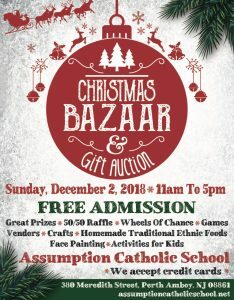 Assumption Catholic School at 380 Meredith St in Perth Amboy, NJ will hold its annual Christmas Bazaar and Gift Auction on Sunday, December 2, 2018. Hours: 11am-5pm. FREE admission. Bring cash or credit card. We offer a full kitchen featuring homemade traditional Ukrainian and Spanish foods, bake table, games for kids. Many vendors and crafters, gift auction and 50/50. Get a sneak peek at some great raffle prizes. Remember this is only a sneak peek of some of the things we purchased and received! PRIZES: Play Station 4, Smart TV, Chromebook Laptop, designer COACH handbag, a Vera Bradley bag, Beverage dispenser, Spice Rack w Spices, Cuisinart Knives, Hot Wheels Cars, Hair dryer, Conair Wand, Kids Workbench, Cuisinart Hand Blender, Bluetooth Speaker, Vanity Mirror, Pancake Griddle, Animal Huggs (toy), Bath Toy Set, Electric Skillet, Food Warmer, Bakeware, Cuisinart Toaster, Farberware Butcher Block Knife Set, Panini Grill, Cuisinart Oven, Pots/ Pans Set, Instapot Dishes, Steamer & Laundry Rack , Shoe Organizer, Queen Comforter & Throw, Eureka Vacuum, Keurig, Slow Cooker, Utensil Set, Girls 3 Wheel Scooter, Electric Air Fryer, 4 Wheel Quad, Craftsman Drills , Proctor Silex Tower, Somerset Patriots -4 upper box tix, Lenox Vase, Bertucci’s Restaurant $25 g/c, IPlay America, Rutgers – 2 Tix Mens Basketball, Red Bulls -2 Tix, Don Manuel Restaurant 5- $10 g/c, Newseum 2 Gen Adm Tix, NY Jets Poster of Player #92, NY Giants Poster, State Theater New Brun- 2 Tix, Herr’s Food Inc -72 Snack Bags, ADIDAS Bags – 2, Charlie Brown & Christmas Tree, & Other , Baseball décor / memorabilia, Tool Box , Fire Pit & Smores, Wegmans -$50 g/c x2- VISA, Wegmans – White wine Basket, Wegmans Red Wine Basket, Girls Bike, Boys Bike. Handmade items: Crochet, cup cozies, wine totes, pet items, Purple Dew Jewelry, Lisa B’s Holiday, Wreathes, scarfs, blankets., Handmade Jewelry, Touchstone Crystal, 925 Jewelry, All American Games –Toys. , Religious Items, Handmade Items: Victorian Angels, personalized ornaments, Handmade wooden items, Face painting. Vegetable Soup, Soda, Water, Coffee, Tea, Deserts Table. We can’t wait to see you all at our Christmas Bazaar and wish you the best of luck winning raffle prizes. Backpack Drive for Ukrainian Children.